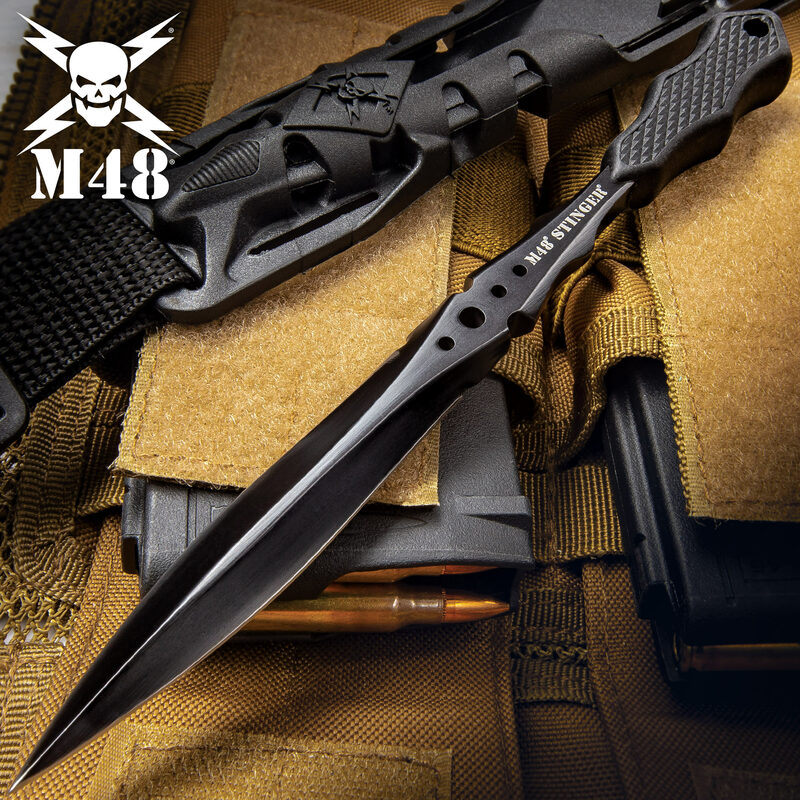 M48 Stinger Urban Dagger Black With Harness Sheath | BUDK.com - Knives & Swords At The Lowest Prices! From United Cutlery, this double-edged M48 Stinger Urban Spike features rock-solid 2Cr13 stainless steel construction with a razor-sharp edge and a point that will effortlessly pierce practically anything. This black version offers an anodized, non-reflective black coating for a tactical look and feel. It won't bend or break like cheap imitations. The rubberized, textured handle provides a sure grip so you can wield this stinger confidently, and the rubberized shoulder sheath will house it securely. 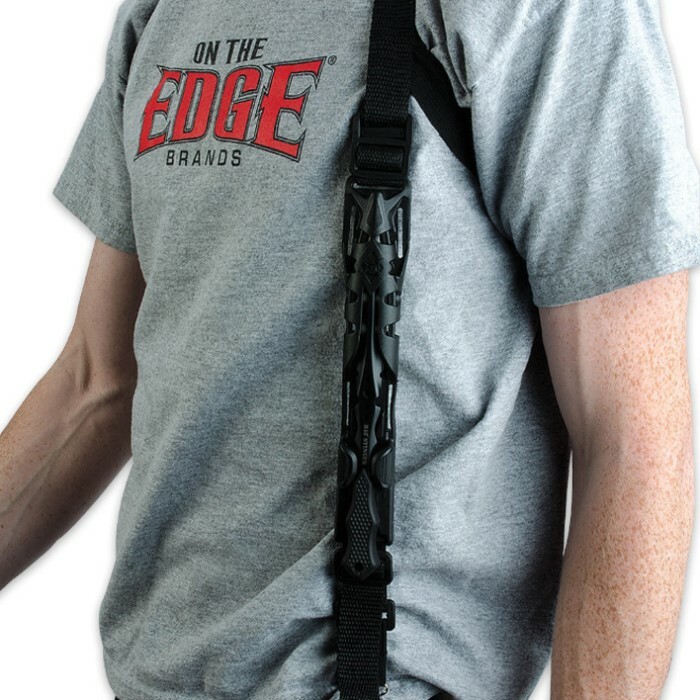 Whether you want to use this spike for easily concealed, discreet personal protection or simply for recreational throwing, it won't let you down. What impressed me immediately is that this knife is chunky. Really nice weight to it, and despite the handle being small it has a surprisingly comfortable grip, even in my big hands. What this thing is, is a modernized/updated version of the “sleeve daggers” issued to OSS agents during WW2. Its sole purpose is being a concealable thrusting/stabbing weapon. You won’t be able to put an edge on it, it is far too fat. This spike is a piercing weapon, similar to a stiletto. It is not a throwing weapon. It is meant to go through thick material protecting vital areas. I loved everything about this knife up until I started throwing it. Granted this was my first thrower. The rubber handle will come loose. Glue and tape didn't hold. The handle got all mangled throwing it at a tree the first time using it. Ok, now the plus side. Easily concealed under the lightest fabric. Smooth pull from the case and it's ready to go, just make sure you don't stick yourself in the neck putting it back. Would I buy it again? No. This is just a fun little throwing knife. the edge is not sharp and had a really wide angle like a axe. the dagger is very tough and durable but the blade is very hard to sharpen with such a wide angle.This thing is a stabber not a cutter.I couln'nt even get it to cut my hand and I tried. Also its much smaller in person than you'd expect. Basically if you want a neat tough throwing knife get it if you want it as a self defence dagger which it is supposed to be then don't bother. This knife is VERY strong, but that's where it stops. The grind angle is 30 - 40 deg, this is supposed to be a knife, not a skinny hatchet. You cannot put a proper fighting sharp edge on it. I have no idea how someone would consider it, balanced, it is not. If ever used for it's intended purpose, the user would find out how unbalanced and ill fitting the grip is. The holster is useless, unless you're 7'2. It extremely thick...why ? You could probably it drive through steel drums all day, but so what ? It is SUPPOSED to be a stealth fighting knife, not a machinist tool. To get it out of the sheath quickly takes two hands, very clumsy, and it would be hard to get out in the heat of the moment. great spike. the shoulder holster is alright. 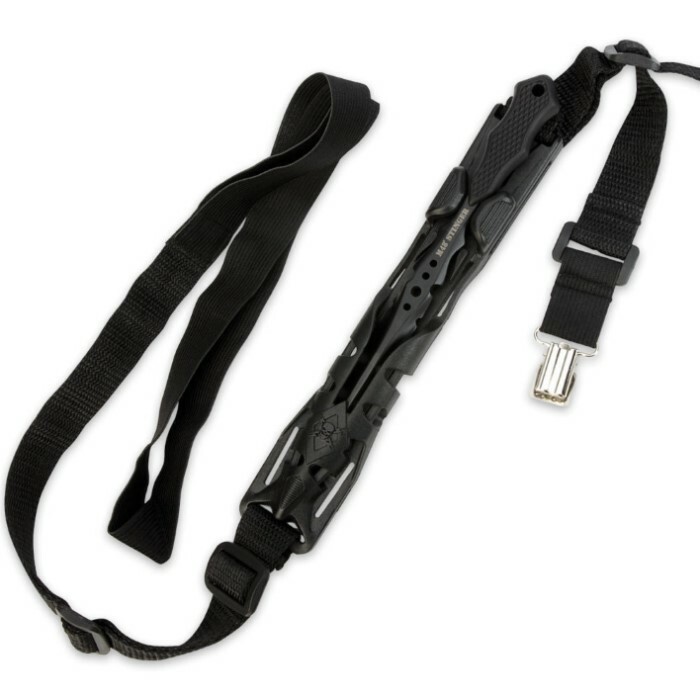 I ordered this knife with the united cutlery stealth tanto trench knife with the same style shoulder holster. so now double trouble. I do love BUDK.com i have been a loyal customer for more then 15 years. great company to deal with. anything M48 by united cutlery is great. This is a really well designed knife. It has a great feel. It is well balanced. The black coating looks great new but comes off easily. The shoulder harnis is really clunky. The sheath is not bad, a bit bulky under a shirt or jacket. I think it would be a struggle in and emergency! It probably works best on your belt.